Skinny Tan - Rose Gold Limited Edition. 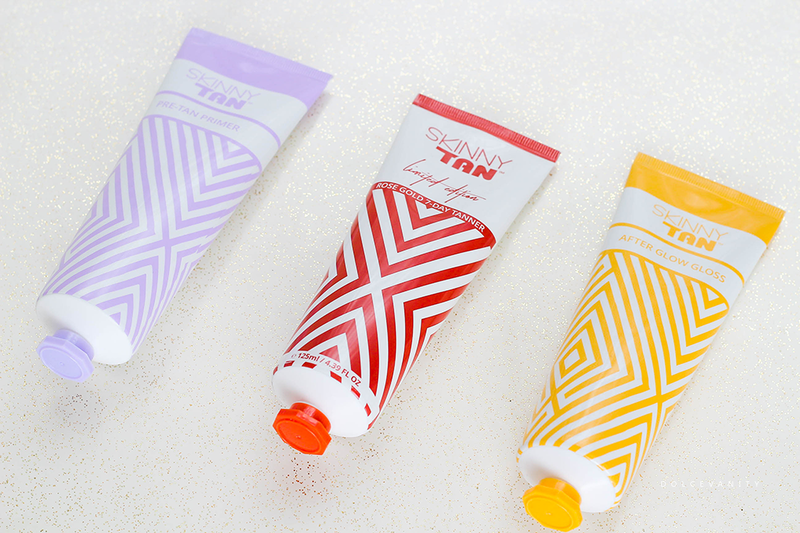 Skinny Tan has been makes waves throughout the Australian shores and with the formula being perfected, it’s home in the UK ready to grace our skin to be a bronzed goddess. After successfully being on Dragons Den and having two investors in Kelly Hoppen and Piers Linney they’ve been changing the perception of fake tans. Most tanners have a chemical form of DHA that can be drying and cause damage to the skin - plus it gives that biscuit nasty smell. Skinny Tan is one of the first self-tanners that use a natural tanning active derived from the seeds of the Brassica napus plant. Making it a bio-organic form of DHA, working with amino acids in the skin to create the darkening reaction for a natural looking tan! As it's natural the biscuit smell is reduced significantly and most people cannot detect it at all. Skinny Tan is the first self-tanner that combines natural tanning active with naturally derived skin smoothing actives to tan, contour and reduce the visible appearances of cellulite with the help of Guarana, a caffeine derivative which is popular in firming and cellulite creams. Yeah I got some cottage cheese on the side and underneath of my thighs. Unless I’m sitting down, the ripples are cool. The tan claims to instantly bronze and last for up to 7 days. Smelling like a coconut island breeze while being streak free. Oh and let’s add – cruelty free and suitable for vegetarians and vegans. I was graciously sent a lovely box of Skinny Tan items. This is to help you prep your skin before tanning. Remove any dead or dry skin cells with this crushed walnut shell primer. Use this a few hours before you tan – not immediately before. A moisturising gloss, that is created to give a red-carpet glow without the ‘gimmicky glitter’. Double-sided mitt. The brown side gives gentle exfoliation that’ll remove dead, dull skin cells, while the orange side is a professional level dermabrasion tough enough to remove excess tanning from palms, ankles, knees or elbows – best believe, always needed!!! Double-sided soft tanning mitt – best quality in the UK – Helps smoother tanning application and to protect hands from tanning. I get so apprehensive with trying out a tanner because it's that familiar tanning smell of biscuits that nobody wants to smell. Just alerts people - tanning & all the negative stuff that comes along with it such as streaks and orange skin. But here we go - I got in the shower to use the Pre-Tan Primer with the Exfoliating Mitt and was so surprised at the mitt, it reminded me of my salux cloth mixed with my korean italy mitt - f-ing dope. If you're not interested in tanning but want a mitt that's going to get rid of that old skin, I'd suggest this. The pre-tan primer has a thick cream consistency with Walnut Shell Powder that you can see within the primer and it works very well with the mitt, my skin was red but not irritated and the smell - let's focus on this for a moment; forget that it's labelled as a pre-tan primer, this exfoliator and it's smell has to be one of the best I've smelt in a minute. Had me feeling like I should of had palm leaves fanning me. It's got a sweet but almost vanilla scent. Using the Tan Application Mitt I gave a somewhat generous squeeze of the Rose Gold 7-Day Tanner and was met with a medium bronze lotion with some rose gold particles running through, once again smelt very similar to the pre-tan primer. It glided on with ease, I couldn't see any colour guide but keep in mind after the blessed weather we had in the UK the past couple weeks my skin decided it knew how to catch sun. Within minutes of buffing it into my skin with circular motions, the rose gold particles became evident on the skin and it was looking better than most bronzing oils I had used. Skinny Tan what's your secret here? I'd love for this to become a permanent fixture & / or even to have a wash off rose gold body bronzer similar to this cos as I'm writing this, I've not yet washed off the tan - currently sitting with it still on, 3hrs later - needs to be on for 6hrs or left overnight, wasn't gambling with my white sheets and shimmer. But I have read there's no transfer but as I rub my finger along my hand, the shimmer does transfer but it's no doubt easily fixed with a wash plus the tan doesn't stink. One thing I have noticed about most tans I have used it, even when wearing a mitt, the product seeps through as it turns to more of a liquid. While this is more of a cream formula and I had no issue with any product seeping through the mitt to stain my palms - winner. This was left on for probably 8hours in total before I showered and washed it off. 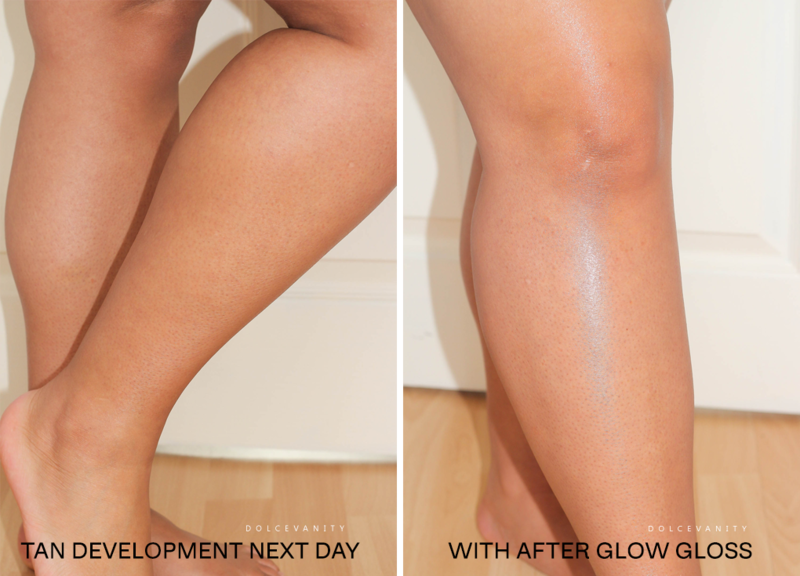 I noticed in comparison to other tans I've used there was much product that was coming off. Maybe it's cos I didn't use much? Or it's just how the product is formulated. During the night I woke up and could slightly smell the oh familiar tan smell in the crease of my arms but it wasn't potent, I practically sleep with my nose smothered into my arm crevice. The brand don't make claims they don't live up to. I found that pretty reassuring with the statement regarding the smell, I noted I had a slight smell of it but after two showers after the wash off application shower. The smell is gone completely but it wasn't strong to begin with but it didn't linger like others can do. My skin isn't dried out or irritated, the exfoliating mitt will be amazing to keep the tan fading naturally. 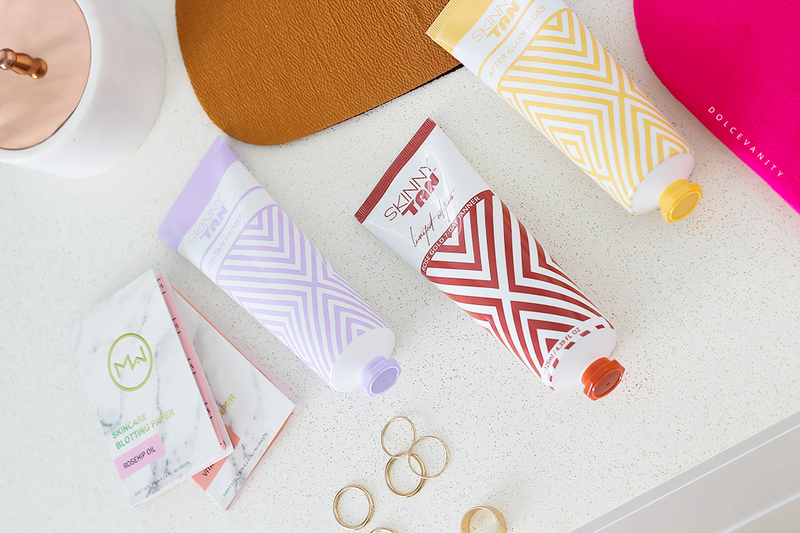 Have you heard of or tried anything from Skinny Tan before? I love the fact this includes a preparation component as well, I always seem to go streaky with most tans so having something like that included sounds good to me. Yeah I know what you mean. It makes it so much easier and allows a more even base. Plus I find doing circular buffing motions help with application. Wow! The effects looks so natural! That before and after pic really shows it off well. I'm always sceptical when it comes to fake tan but this stuff looks great. Thank you. You and I both. Never know what to expect after washing it off and seeing it next day. Thank you. It's worth a try. Get about 4 or 5 full bodies uses I believe out the tube. Your tan looks amazing! I love the sound of these, and there doesnt seem to be a fault with them! Will definitely give them a go. Thanks Sarah, I truly haven't found one so that's a huge plus. I've never heard of this brand before, but I'm going to give it a try! Great to see results like this. It is, no orange hues - phew. Great brand, loving their products so far. I'd never heard of Skinny Tan either. Although I've never actually dared self-tan so that's probably why! I love how this looks on you, though. And the fact that it gives you a lovely rose gold tan is actually enough to tempt me to try it. Wish me luck!